Barman Vincenzo Marianella has been crafting palate-thrilling cocktails in L.A. since before Seven Grand was even a twinkle in Cedd Moses’ eye. At Michelin-starred Providence in 2006 he created a cocktail program that matched the high-quality dishes. And in 2009 he opened Copa d’Oro in Santa Monica which kickstarted that whole farmers market mixology craze. This week I was fortunate enough to get a lesson from Vincenzo in how to invent my own modern classics. Here are his tricks of the trade. ❶ At farmers markets, the early bird gets the best ingredients. The market-savvy pretty much knows this already but Vincenzo brought up a good point: “The thing is you need to get there kind of early because they have beautiful products but especially right now it’s under the sun for six hours.” Unfortunately for Vincenzo, his favorite farmers markets are on Sundays. And after working late on Saturday nights, it’s difficult for him to get to. Fortunately he has other markets he favors like Culver City on Tuesdays and Santa Monica on Saturdays. ❸ When all else fails, build on classic cocktails. Like Comme Ca’s Sam Ross pointed out in his cocktail class, all classic cocktails share basic components, making it easy to switch out the base spirit, sweetening agent, citrus, etc. to create different drinks. Like a whiskey sour, if you change one ingredient, like replacing the whiskey with Citron vodka, you get a Lemon Drop cocktail. “It might not be a classic but it’s still very popular.” When you change out the vodka for gin and lime for lemon, you now have a Gimlet. Rum instead of gin and you have a Daiquiri. ❼ To save time, free pour spirits, jigger soda and everything else. If you’re throwing a big party and have taken it upon yourself to make all the drinks, you can save time by learning how to free pour spirits instead of jiggering everything. 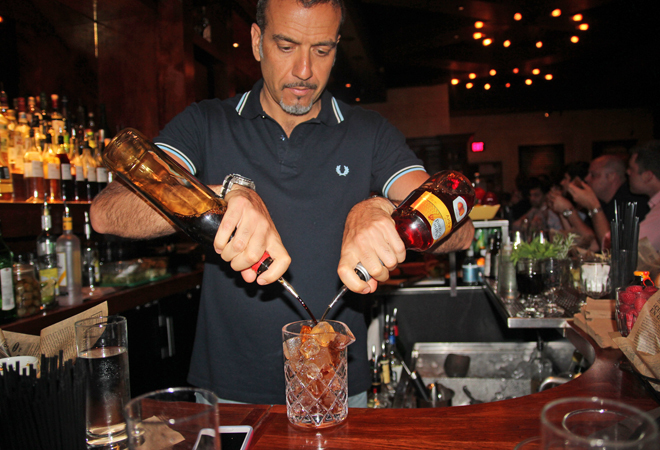 For his high-volume bar Vincenzo has trained his bartenders to free pour spirits when making cocktails. “I saved one movement, which means I saved 10 seconds which means I saved 10 minutes in an hour, 100 minutes in 10 hours, which means I sold $1,000 more and the customers will be happy.” Most bartenders out there who use jiggers to measure spirits don’t fill it up to the line and that throws off the balance of the cocktail. ❾ Don’t forget to garnish. It’s important not just for visual presentation, but for aroma. “First we judge a cocktail with our eyes and second is with our nose. You bring the glass to your nose and naturally you just take a breath.” Try expressing a lemon peel over a glass of plain water. It improves it 100 percent. ❿ Balance, balance, balance. To make a balanced cocktail, use two ounces of a base spirit, three-quarters of sour and an ounce of sweet if simple syrup (1:1 sugar and water) or three-quarter if rich simple syrup (2:1 sugar and water). “With this formula here, we’ve been making cocktails for four and a half years and I recall only one bad review on Yelp and we have more than 500 reviews.” Vincenzo also uses two ounces of spirit instead of the usual one and a half that most bars and restaurants use. “If you use an ounce and a half with these proportions, it will be too weak.” For stirred drinks, his formula is 2 ounces base spirit (can be broken down into two spirits), 1 ounce of flavoring agent (can be up to three ingredients), 3 to 4 dashes of bitters. 1) Combine all ingredients in a shaker filled with ice and shake. 2) Strain into a cocktail glass and garnish with a cucumber slice.